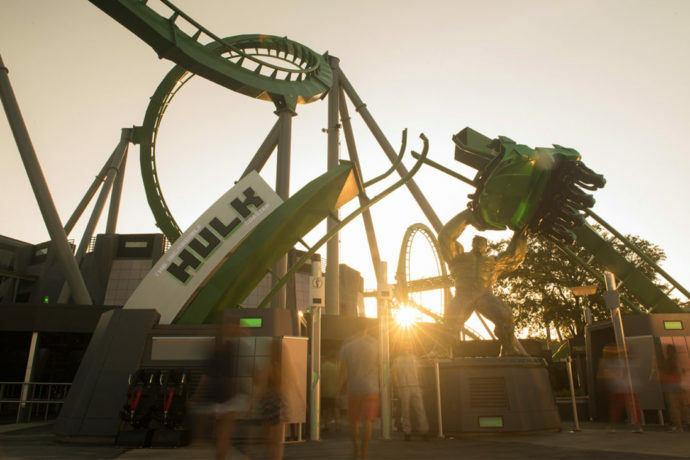 The Incredible Hulk Coaster at Islands of Adventure has been completely refreshed and is now open for guests! We’ve witnessed the entire track being replaced piece by piece, the queue building get new paint, signage, and storyline, the whole area receiving beautiful nighttime lighting effects, and a gorgeous new entrance created with a realistic full-size Hulk statue standing tall. But now we finally get to see what the queue looks like inside, how the launch tunnel has improved, and what the on-board music sounds like on the ride! It’s wonderful to see such a classic attraction like the Hulk receive some much-needed TLC. I love the new area music around the Hulk courtyard, (hear it in the video below just after a minute in.) It has a military feel, and is very cinematic, perfectly punctuating the new area theming as a secret military base and scientific lab. Check out the video for your area update plus the images below of the updated ride, queue, and grand opening ceremony. Stay tuned for more theme park updates coming soon! So wonderful to see guests riding again after such a long hiatus! The Incredible Hulk Coaster now features thrilling new enhancements that make one of the world’s best roller coasters even more incredible. Enhancements include a brand-new ride vehicle, a new, original storyline and completely redesigned queue experience, and an all-new onboard ride score produced by Patrick Stump, front man for the internationally-renowned rock band, Fall Out Boy.